What a great books did you got. And your daughter is adorable. I can't wait to read quick fix! The first one was soo fun! Happy reading! I want to read The 5TH Wave so badly! So much hype but I can tell it's going to be really good. Hope you enjoy it! Your daughter certainly has gotten so big. I so want to read Fifth Wave. Hoping they will have it at BEA. Nice haul. Such a beautiful baby, I bet you read to her a lot!!! Hope you enjoy all your new reads, been hearing great things about The 5th Wave. Great book haul. I have heard nothing but good things about Clockwork Princess. I haven't had time to start that series yet, but one day I will get around to it. Your little Lily-Ann is getting so big! In A Fix was a book I got from NG that I never got a chance to read, and now already people are getting ARCs for the second one! Ah! I must tackle my NG reading 'pile'!!! Lily-Ann is getting so big! And I love how she kept grabbing the books, she's going to be a reader - yay! Awww! She's getting so big!! She has hair now! :) I was bald for a long time, as well as my sister and niece! Nice book haul too! I adored Hemlock! Hope you enjoy that one too! Oh, you got some excellent books and your little girl is so cute. I want Twice Tempted and Have Cassandra Clare on my wishlist. This 5th Wave sounds so awesome!! I am dying to read Quick Fix too. I loved In A Fix. Clockwork Princess was so good!! Great haul! Good list! I'm really wanting to read The Fifth Wave! It's a nice assortment! I hope you find time to read them all quickly. Haha, your daughter is beyond adorable! 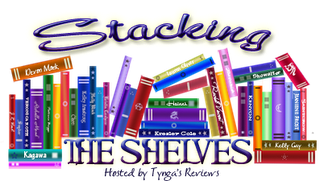 I love how she kept playing with the books :) I'm going to do my first Stacking the Shelves, I'll make sure to add my blog post to the linky list!